Being married lends itself to new obstacles during the holidays that were never issues before. Mark and I are on a rotating schedule each year as to which Thanksgiving we will be attending. Since the majority of both our families are in Washington State, no matter which Thanksgiving we are headed off to- it is guaranteed to be a full house, never less than 10, oftentimes larger than 30. I'm thankful that Mark and I actually have that much close family relatives to spend time with- and I love seeing all of them. This year we will be headed to Lake Tapps, a place I spent most Labor Day Weekends, several Easters and 30 family reunions! Without fail there will be a roast turkey as well as a smoked turkey, homemade rolls from a baker from Odessa, WA who makes them fresh for our family every year, homemade elk and venison sausage appetizer (from last February's homemade sausage making) and several other fabulous favorites, be it Aunt Arlene's Cheesy Potato Casserole, to Aunt Rae's Chestnut Stuffing and of course, several bottles of homemade chardonnay and pinot noir from the 36th Ave wine makers, i.e. "garage wine from my aunt and uncle, Mark and I and the residents of 36th Ave."
My mother, classically never makes the same thing twice, and will no doubt bring a new salad recipe which always is well received. Grandpa will say grace, tell some Norwegian "Ollie Jokes" and we will no doubt toast to new weddings, new arrivals (congrats Jess!) and the passing of relatives- a farewell to one of the family's ultimate gourmands Uncle Don Walter, cheers to you. I'm in love with smoked fish. Sure, I love smoked salmon on a salad and gravlox with capers, but I also love smoked mussels and smoked oysters right out of the can. "That's not ultra farmer-market fresh" you might say, but throw that smokey, delicious shellfish onto a farmer market salad and perhaps we can come to some sort of an agreement. I'll take a smoked trout salad with avocado on butter lettuce over a foie gras topped filet Mignon any day of the week. Perhaps it's the imitation crab sticks in the refrigerator snack drawer that were always there, or the 2 pounds of steamed clams that was often a favorite of my mothers as an ideal main course for dinner. I can see the large bowl of grey, steaming clams, mouths wide in the middle of our family table, my brother and I with our little dishes of melted butter, and my dad- always with his bread and butter to soak up the clams' juices. I remember playing Atari in the living room with my brother and as a snack, we would be given a fork and kippered fish still in the can. Healthy for sure- all those lovely omega-3s, but a bit odd compared to apple slices that most kids ate. Of course we ate tuna fish sandwiches, but my restless Gemini mother knew there were more fish options out there- be it canned, fresh, cracked, fried or smoked, we tried them all. Sometimes we were given half of a steamed Dungeness crab over newspaper, creamy oyster stew with sourdough or shellfish-rich cioppino for our Christmas dinner. Open the can of oysters and place them on a small plate. Place that plate onto a large platter. Arrange the pear, avocado, baguette slices around the plate. Place the wedge of gooey cheese onto the platter with a broad cheese knife. Toss the greens with a little olive oil and salt and pepper and distribute greens onto two serving plates. Encourage your guest to spread the gooey cheese onto a slice of bread and top it with a smoked oyster. Or try a baguette slice with cheese and avocado, or cheese and pear. The idea is to encourage flavor experimentation. The basic olive oil greens add a nice simple salad in contrast to the rich cheese and oysters. Like with any recipe- adding or subtracting different ingredients is all part of the cooking process. Perhaps add some duck rillet or tangerine slices to this simple picnic. 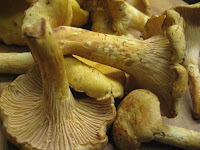 I encourage you to take advantage of chanterelles while you can. Perhaps you have a brown bag of fresh chanterelles in your fridge as we speak, just begging to be sprinkled on a pizza or tossed in some lovely pasta dish. Well here is another idea: I recently bought a bag of chanterelles and purchased a nice, organic, rib-eye steak and came up with a little compliment to both. In a large, oven-proof saute pan over medium-high heat, add butter and 1 tablespoon of olive oil. Once pan is hot, add chanterelles and a pinch of salt and pepper and saute for 5 minutes. Add oregano and cook another 3 minutes until mushrooms are soft and mushroom juices begin to collect in the pan. Remove mushrooms onto a plate and drain juices into a separate dish. Place chanterelles back in the dry pan and saute them for another 3 minutes, stirring often to caramelized them further. Place them back onto the plate and keep warm. Add the remaining tablespoon of olive oil to that same pan and adjust heat to high. Rub both sides of steak with salt and pepper. Once pan is just about smoking hot, add steak and sear for 2 minutes per side and place the whole pan into the preheated oven for another 4 more minutes. Remove steak from the pan and let it rest on a serving plate in a warm space for at least 3 minutes. In that pan again, add chanterelle juices and reduce over medium-high heat for just one minute, turn off heat. 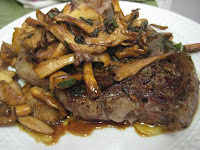 Pour warm chanterelle juices over steak and top with sauteed chanterelles. Serve immediately. 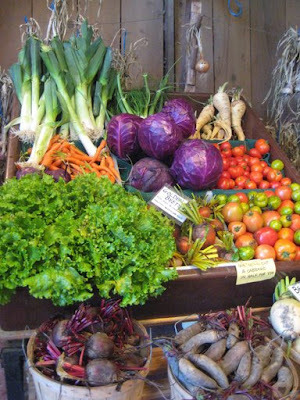 Farmer's markets in the Fall hold a special euphoria all their own. Mark and I have equated the Sunday Ballard Farmer's Market as our church. We go almost every Sunday, we see familiar faces and catch up on news, we gather with a community of people with like-minded views and we celebrate a common passion: supporting local farmers and promoting the farm to table movement with the desire to encourage others to experience seasonal produce at it's peak. Most recent purchase: wild chanterelles from Foraged and Found Edibles.